in the Seattle area still have a good time at Rotary First Harvest work parties, where they repackage surplus produce for distribution to the hungry. 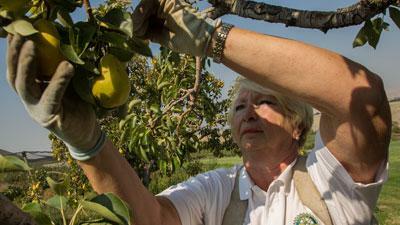 "The work is rewarding and great fun," says David Schooler, Rotary member and president of Rotary First Harvest. The organization collaborates with farmers, truckers, volunteers, and food banks to move food that might otherwise go to waste to food banks and meal programs for those in need. break down 1,000-pound bins of food into smaller boxes or serving bags. They also volunteer on farms to gather fresh fruits and vegetables that aren't economically viable for farmers to harvest. In one season, Rotary First Harvest coordinated 1,500 volunteers and provided 3 million family meals. idea," says executive director David Bobanick. "They were able to grow and develop that idea by getting other Rotarians engaged and using that powerful network of Rotary to really change the world."